In Haunted Hop, the player is tasked jumping over the fire rope. When they successfully jump, they receive a point. If the fire hits them, they lose. Sounds easy enough? Watch out though, the fire changes speeds, making a game which sounds easy quite challenging. I was responsible for the prototype, game design, level design, programming, UX, running user tests, and UI design (UI art was Josie, I did placement and functionality). Haunted Hop actually started as a prototype I put together back in April 2014. Initially, the game started with seven different rope speeds. As development progressed, I found that I couldn't properly message to the player the rope speed changes due to a bug in the system. I also found that seven speeds might be too difficult for players to track. After iterating and play testing, I narrowed the speeds down to three: fast, normal and slow. This was easy enough for anyone to understand, and we were able to message the speeds to players via using traffic light colors. In traffic lights, red means stop, yellow means slow down, and green means go. We used these to mean red fire is the slowest, yellow/orange is normal, and green is the fastest. Because we used the design of something in the real world which everyone already understands, we were able to quickly have players understand how to play the game. I actually didn't need a tutorial because I used ideas people already understood. This cut down not only the barrier to entry, but the amount of time we had to hold the players hand to nearly none. Of course, every game starts off with three rotations of normal speed fire. This allows players to get used to the gameplay and try out the jumping without much trouble. After that, I have the game choose randomly between the three fire speed options available as the player learns how to play the game. You might be wondering, "But wait, how does it ramp up then? So within five seconds the player has seen everything and can easily master the game?" Not quite! Over time, the location where the rope changes speeds actually moves ever so slightly up to a certain point. This gave the player slightly less time to react, increasing the difficulty, and overtime forcing them to get to know a slightly different pattern. One of the specific challenges I put upon myself is that I wanted the app to feature a single input. I had seen other games do the same, like Flappy Bird, or countless other infinite runner apps. So I designed around that idea. Simplicity and ease of use were two of my design goals. Another idea I wanted to implement was keeping the player in the game for as long as possible, and keep them from having to navigate through countless menus to play the game or just to start over. The numerous menus were actually a problem players had with some of the games I had worked on in the past. When the player boots up the app, they are brought to the "Tap to Start" screen seen above. The player only has to touch the screen to start the game. No menus, nothing getting in the way of the game. You'll also notice the "Game Over" Screen above as well, in which I wanted to keep the menu as simple as possible, so it only has two buttons. "The Play Again" button brings the player back into the action, and doesn't force them through any other screens. Just moves them straight back to the "Tap to Start" screen. Continuing with our simplicity goal, take a look at the HUD. I wanted to have as few buttons on the HUD as possible so it wouldn't distract from the game play. 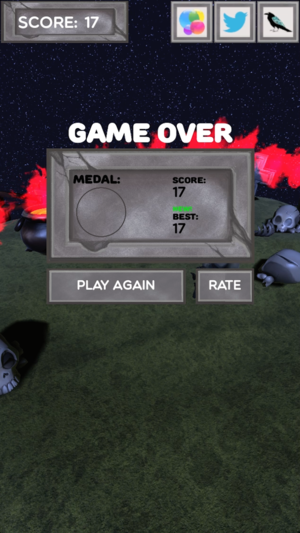 As our game would demand complete focus of the player, I only added a score counter, "Game Center" button, Twitter share button, and a credits button. These specific buttons were allowed on the screen because I thought the player may want to access them before initiating the game. Disclaimer: 2D art created by Josie Noronha. 3D art acquired through the Unreal asset store by BitGem3D and BRAiNBOX.